SayWhatNews: Thanks so much for taking the time and speaking with SayWhatNews. Tell us who is 3nity? 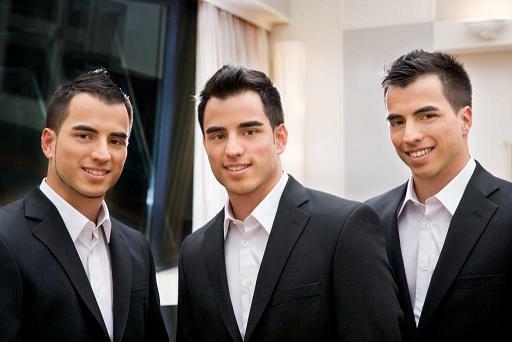 3nity: We are actually triplet brothers, originally from France (Paris) but trying to share our music with as many people as we can around the world. In case some of you want to know, our names are: Romain, Sylvain and Vincent. SayWhatNews: Tell us about each brother. Who is shy/quiet one; who is comedian and who is the more out going one? 3nity: Even if we are triplets, we have indeed different personalities. Vincent would be the quiet one, Sylvain the comedian and Romain the more out going. However, these particularities can change depending on the situation, so people may get confused he-he. SayWhatNews: What was it like growing up as triplets? 3nity: Obviously it’s something uncommon. While some kids would grow up without having no sibling, we already had 2 with the same age. It made everything entertaining, we always had someone to talk to and to play with. We’ve always been best friends. By the way, we also have 2 big brothers which made us grow up in a quite large family. SayWhatNews: At the tender age of 3 you guys started modeling and even did photo-shoots for magazines such as Vogue, Madame Figaro and kids pictures for Tony Boy and Anny Blatt; how did you get into doing TV ads? 3nity: Well, it was pretty unique to have kid models like us, triplets and mixed (European/Asian), so we received quite a lot of demand. Thanks to our modelling agency, we had castings every week for different sorts of things, from magazines to TV ads, this is how we got into it. SayWhatNews: At what age did you guys realize you had the gift of song? SayWhatNews: Did each brother have an interest in singing and making it a career? 3nity: Yes we all have the same dream and interest. We would like to keep singing as long as we can. At the same time, we would like to develop more and more the music production part, especially for other artists. SayWhatNews: How did you come up with the name 3nity? 3nity: It’s actually a play on words with the fact that we are “3” and the “unity” of us as brothers. It all came up a couple of years ago when we were looking for a name and we thought of it with our family. SayWhatNews: The group started off performing acapella to songs from Boyz II Men, Dru Hill, Brian McKnight and Babyface. Who would you say was your musical influence growing up? SayWhatNews: 3nity harmonizes so beautifully, do you guys have any professional training? And do you play any instruments? 3nity: Thanks for the compliment. Actually we are autodidacts, so we learnt how to sing and to play instruments on our own. The fact that we are triplets probably helps too, in the sense that we don’t have to talk too much to understand each other. By the way, Romain plays the guitar and Vincent the keyboard. Sylvain deals with all the programming on the computer. SayWhatNews: By 2002 Gospel music entered your life and music. Tell us what inspired the change in genre of music. 3nity: It seems that Gospel music had to come into our lives and inspire us. It’s so powerful in every way, we can’t help but just draw the positive energy from it and spread it into our music. This is that special thing that made us go higher, bringing this pinch of salt we needed in our soul. It seems that people can feel those emotions through our songs. Talking about Gospel, we had the chance to perform with the legendary singer/songwriter Richard Smallwood for a concert in Paris, it was memorable. SayWhatNews: Tell us how 3nity joined the French gospel choir Gospel Pour 100 Voix? 3nity: We heard about the choir from a friend who was part of it. Then we went for an audition and they took us. Since then we have been singing with this fantastic choir, touring all over France and Europe. SayWhatNews: 2007 3nity released its first album “Kita Satu” with EMI Music in Indonesia (South East Asia). Tell us how this project came to be? 3nity: Back in 2005, we had different offers with labels here in Europe. We had an opportunity with EMI Music in Indonesia, our mother’s country, we just decided we had to go back to our roots, this all came naturally. The guys from the label really felt our music, we really had to go for it. SayWhatNews: How amazing was it to record and release your first album? SayWhatNews: 3nity has had a lot of exposure by competing in talents shows such as Incroyable Talent Season 2 and the popular American talk show Maury Povich who held a World Most Talented Twins and Triplets Contest. Tell us about each competition. How did you learn about the talent show and how far did you make it in the competition? 3nity: Every time we have been contacted to participate in those contests. For Incroyable Talent, we made it to the final and for The Maury Show, we got the second place. We also represented France in one of the biggest international music contest in Europe called “Cerbul de Aur” (Golden Stag) in Romania and we received the “Special Prize of The Jury”. SayWhatNews: 3nity, you guys compose, write and arrange all your music. What inspires you to write a song? SayWhatNews: Your singles “To the End of the World” and “I Will” are my favorites. Tell us what inspired those songs. SayWhatNews: 3nity is currently working on a new international album. Do you have a name for the album and how many tracks will there be? 3nity: We are indeed working on new songs for the next album. However, we have more than enough for one album. We keep making more and more to really select the ones we like best. We haven’t got any album name for now. SayWhatNews: When can 3nity fans expect a Worldwide Tour? 3nity: We wish it to happen soon, it would mean that we meet success in many countries. We work on that and we cross our fingers. SayWhatNews: What’s next for the very talented brothers known as 3nity?